First thing is first, if you get the that screen then open the "error.txt" file inside your sof2 folder and check this topic for a solution. This error just means that there are some programs that are interacting with sof2 which we haven't already put in the "allowed" list of programs. These are mostly Microsoft, Nvidia, ATI etc. The only times your likely to see this error is the first time you use fairplay, when you update windows or your graphics card and when programs such as xfire update. Something else you should check when this error comes is if you have a opengl32.dll in your game folder(perhaps you used it to watch a demo and forgot to delete it). If you do have a opengl32.dll in your folder then you must delete it before trying fairplay again(as we will never allow any opengl32s). This simply means that either fairplay isn't in your sof2 folder or your sof2 executible(the icon you click to open sof2) is named wrong. If your fairplay isn't in the sof2 folder, then just move it there and then it should work. Or if your sof2 icon isn't named "sof2mp.exe" or "sof2mp-test.exe" then rename it to "sof2mp.exe"(works for both full & demo) and then fairplay should work. On demo this error happens when your assets.pk3 has been edited from the original one. On full this happens on full when your mp.pk3 has been edited from the original one. If a file has the wrong check-sum(if it has been edited or corrupted) then Fairplay will rename it to blabla.pk3.zzz meaning that sof2 won't load it and boom here comes the error. The only way to fix this is to re-download the game or get a friend to send you the original unedited. This error means that your r_subdivisions is not 46, we force it to 46 because any lower(and way higher, 2000+) than that then you can lean inside the corners of walls and see through them. This is basically wallhack but without the cheat commands or programs. To fix this just open up sof2 without fairplay and type /r_subdivisions 46 in the console. This error is just like the the other cvar errors. We block this command because having it too high allows you to see through smoke grenades. To fix this error just open up sof2 without fairplay and type /fx_nearcull 0 in console. This error means that you either don't have .net framework or your .net framework is old. Fairplay requires the .net framework to work properly, because without it the server and client can't communicate and fairplay would be useless. This means that your fairplay cannot connect to the http://www.caserun.com website, which is needed for fairplay to check some settings. There can be several reasons for this error, such as caserun.com being offline or your firewall blocking the fairplay.exe program. To fix this, firstly check if you can access the http://www.caserun.com website via your web browser. If you can, then it means that it's your computer which is blocking fairplay access to the Internet via - most likely - a firewall or a virus. Most people have different firewalls from others, so the easiest way to fix this is just to google "unblock program x firewall" where x = your firewall name, i.e. "unblock program AVG firewall" and follow the tutorials you should find. 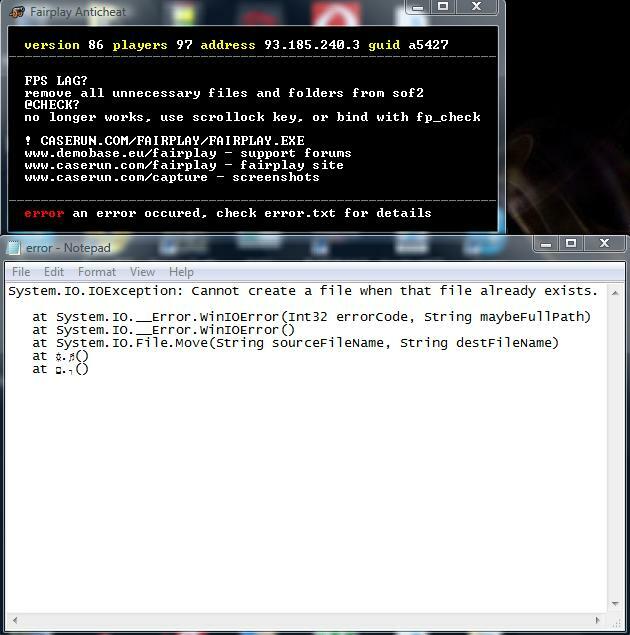 This means that fairplay is attemping to give a file or folder the .zzz extension when the file or folder already exists. You can fix this by manually removing the files with the .zzz extension which are also there but without the .zzz extension, for example if "mp.pk3.zzz" AND "mp.pk3" both exist, then delete the "mp.pk3.zzz" file. Thanks to Max for writing this solution & pointing it out to me. I have this kind of error and I don't know what to do. I hope I could get some help there. System.InvalidCastException: Conversion from string "2.3" to type 'Single' is not valid. ---> System.FormatException: Input string was not in a correct format. System.IO.DirectoryNotFoundException: Kan een gedeelte van het pad c:program filessoldier of fortune ii - double helix mp testdemompdemo niet vinden. put fairplay.exe in "soldier of fortune ii - double helix mp test", not the "mp" folder. i started fp, got into a server, minimized sof and checked fp, and status was working. Demobase INF Open Cup VI - cC. Facing Worlds Clan Tournament II - cC. System.UnauthorizedAccessException: Access to the path 'C:Program FilesSoldier of Fortune II - Double Helix MP TESTsof2fp.exe' is denied. This is nothing, just wait a day or 2 and it will be gone, it just means shifty needs to authorise your use of fairplay. This is the error I am getting every time SOFII is loading the map so shifty please authorize my use of fairplay. System.InvalidCastException: Konwersja z ciągu "50.001" na typ 'Single' nie jest prawidłowa. ---> System.FormatException: Nieprawidłowy format ciągu wejściowego. error: an illegal module was found,try again later. I have try like to many time later and nothing but you say i need wat 1-2 day it going to work? nice. ?